Yoga Moves MS provides an open-hearted approach for mental, physical and spiritual growth through the practice of yoga and yoga therapy. The Yoga Moves MS annual fundraiser is in it’s 9th year! Online donations, together with our annual fundraiser Party with a Purpose, support Yoga Moves MS classes in southeastern Michigan. Your tax-deductible donation to the Yoga Moves MS (YMMS) is greatly appreciated! For nearly two years I have been attending Yoga Moves MS a yoga class for people with MS. The class aims to utilize yoga poses which will most benefit the challenges the disease causes such as muscle tightness, core weakness, and balance deficits. 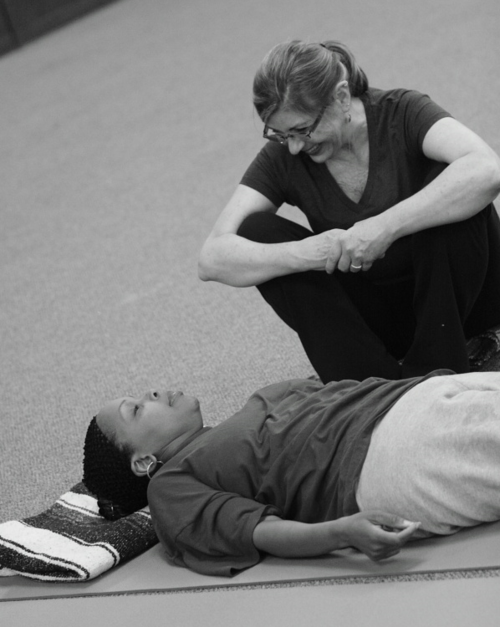 In addition to the advantages the exercise provides, the classroom also serves as a support group since the members all share the experience of living with MS.
Yoga Moves MS founder, Mindy Eisenberg, had a dream to help people with MS live a better quality of life through therapeutic yoga. Through these classes her dream is being realized. However, this beneficial and unique program is not without cost. Many of the instructors work with little or no pay, and are passionately dedicated to Mindy’s enterprise; however, the program is still in need of funding. This is primarily achieved through donations. There is a waiting list of students wishing to attend, but limited funds prohibit more classes being offered. My attending Yoga Moves MS is the highlight of my week. When I leave the class I have the feeling I can accomplish anything. I am disappointed more people with MS are unable to experience such a wonderful class due to financial limitations.